Marathon running is becoming more and more common for the average runner to take part in. While it is amazing to see an avid running population, training for such a challenge entails careful planning so as to promote success and avoid adverse outcomes (inuury). 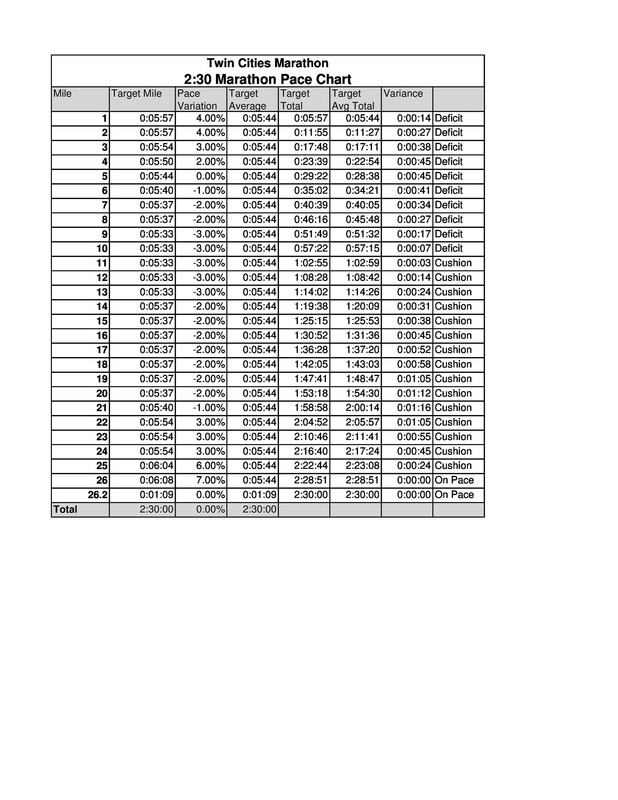 An effective strategy is to use a marathon pacing chart. A marathon is a 26.2 mile (42.195 kilometers) running race, and there are over 570 marathons held in the United States each year. As its name suggests, a half-marathon is a 13.1 mile (21.0975 kilometers) running race, and there are over 1,000 half-marathons per year in the United States alone. There are over 500,000 individuals finishing marathons each year, and millions of individuals completing half-marathons. 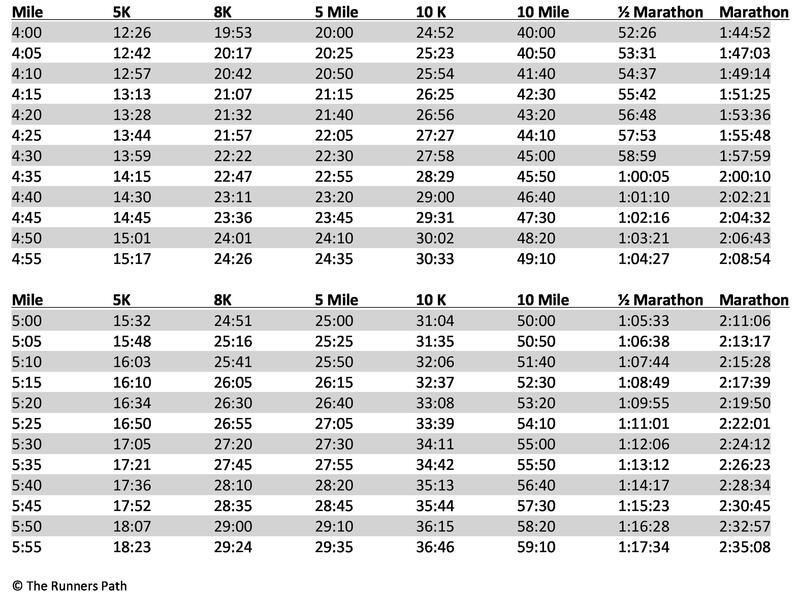 In fact, half-marathons have shown to have the largest increase in participation out of most distance races. Whether a half-marathon or a marathon, these races are a great way to challenge oneself. Runners become “bored” of merely completing the race, and want to improve their pace. 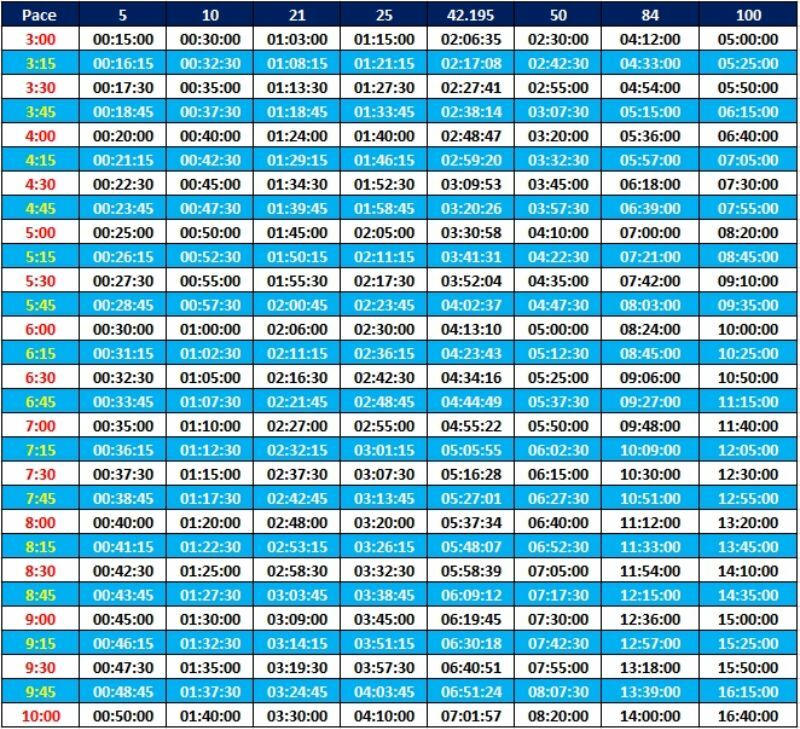 At each stage, a marathon pace chart can help runners set appropriate goals. While pacing is an important tool for progression in a running career, but it is critical that runners understand how to pace themselves for success. While marathon and half-marathon races are becoming more and more popular, there still is a high degree of drop outs among those who start a training program. Why might this be? Inadequate preparation for the challenge ahead, often times resulting in injury. Therefore, it is crucial to any runner to carefully plan for marathon and half-marathon training regimens. 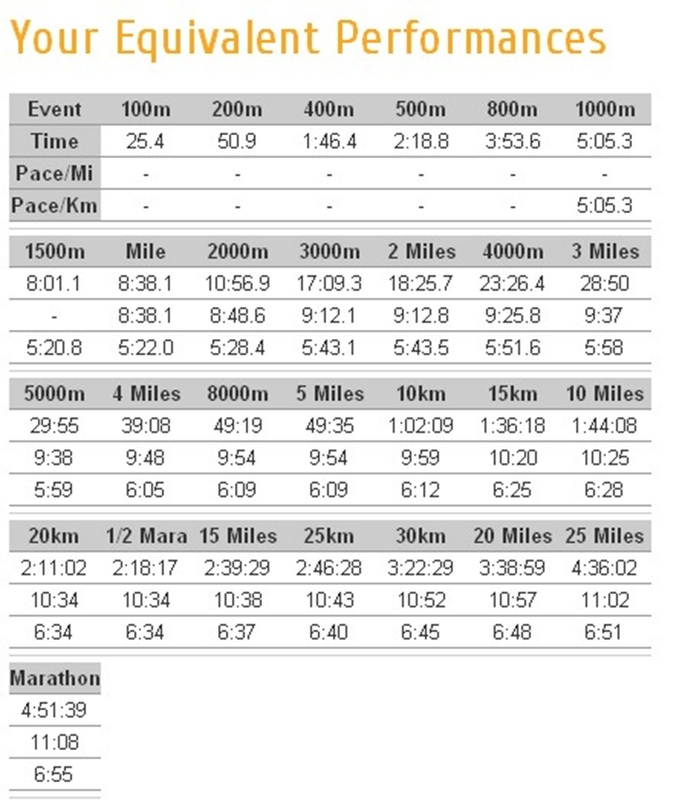 Marathon training should start 16-20 weeks from the race, assuming that you can already run about 6 miles comfortably. 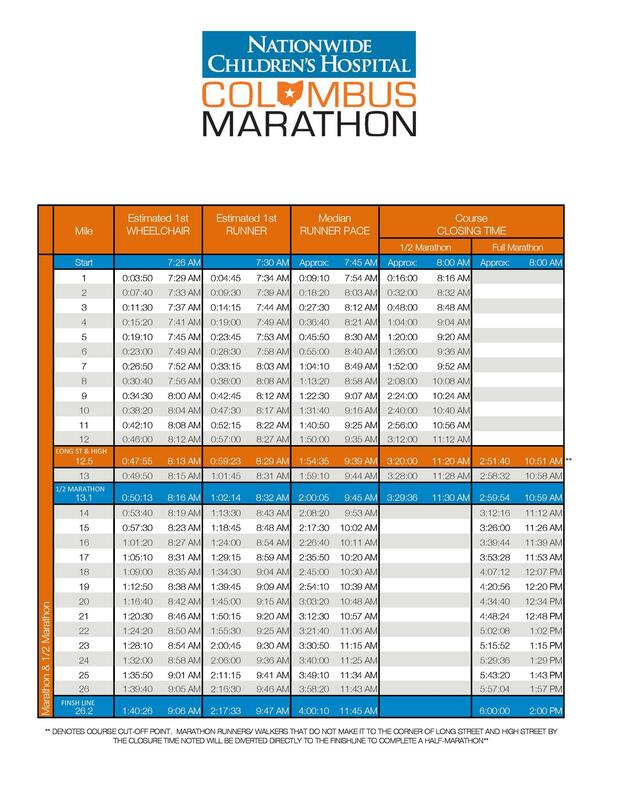 Half-marathon training should start at least 10 weeks from the race. 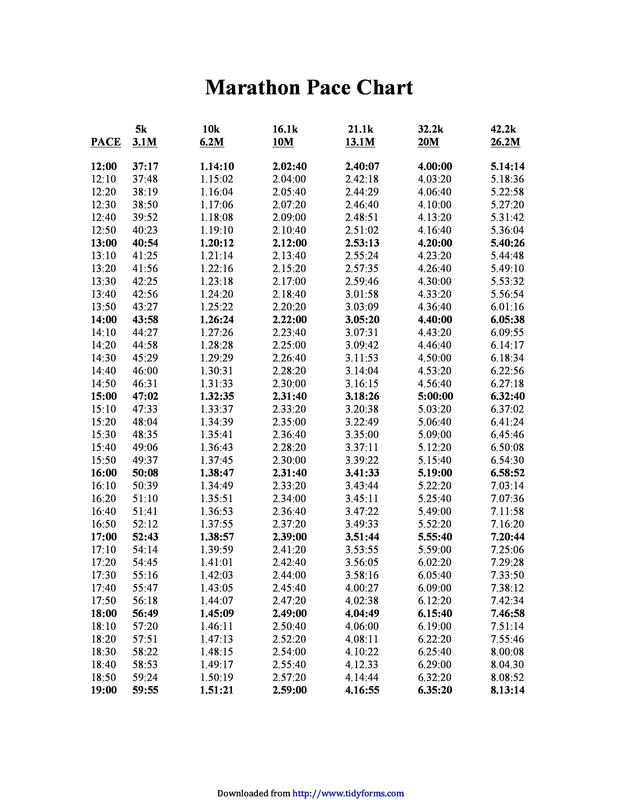 Pace chart may help to set a pace to maintain during training workouts. 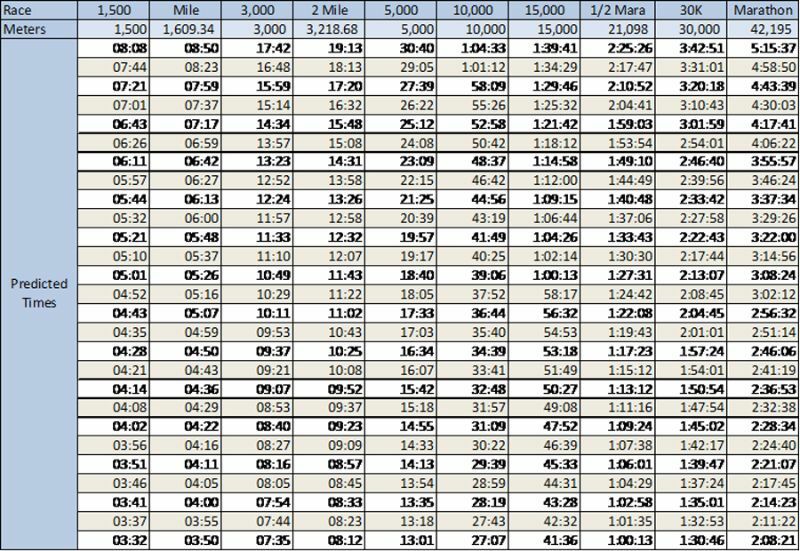 These are useful tools for setting goals on both your speed work days and long runs, giving the runner a time that is attainable based on his or her personal running level. To start your marathon and half-marathon training regimen, first consider your experience and your current goals. Is it your first half-marathon? 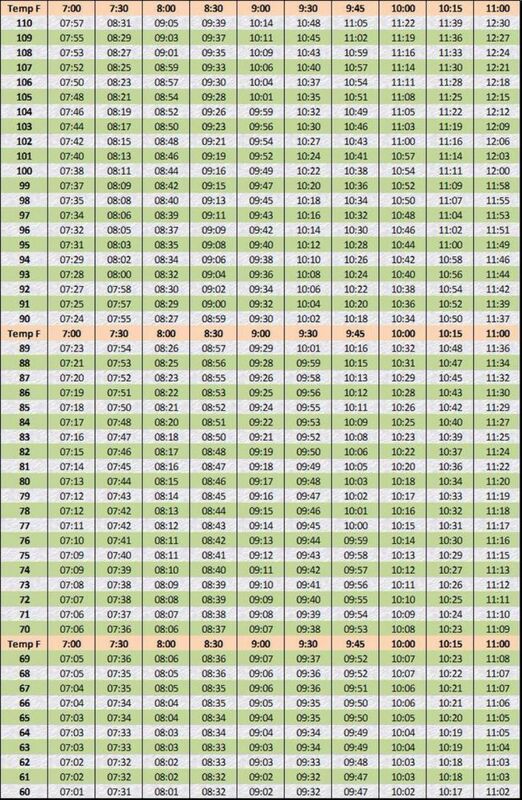 Take time to gradually increase mileage. 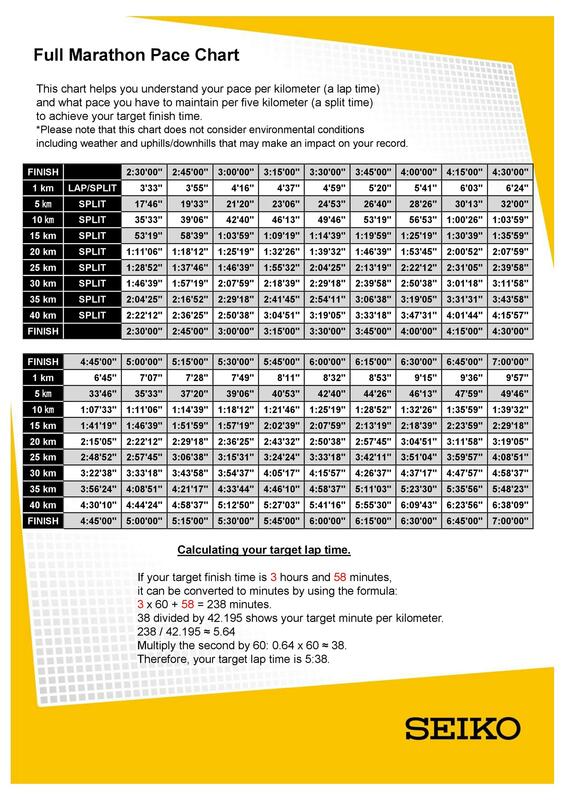 Consider your average timed-mile, and base your “EZ” and “tempo” paces accordingly. Is your goal to improve your time from a previous race? 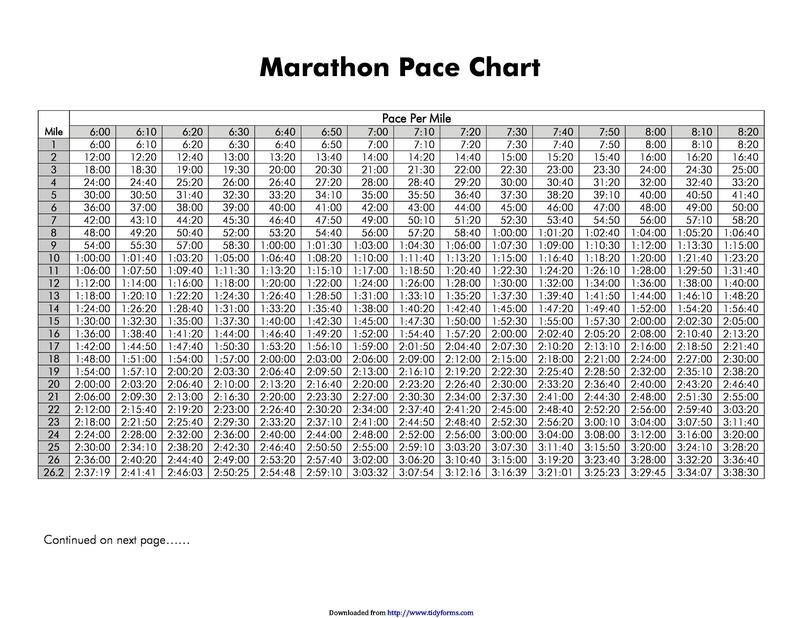 Then figure out what you need to average per mile to beat your past finishing time on the Marathon Pacing Chart. 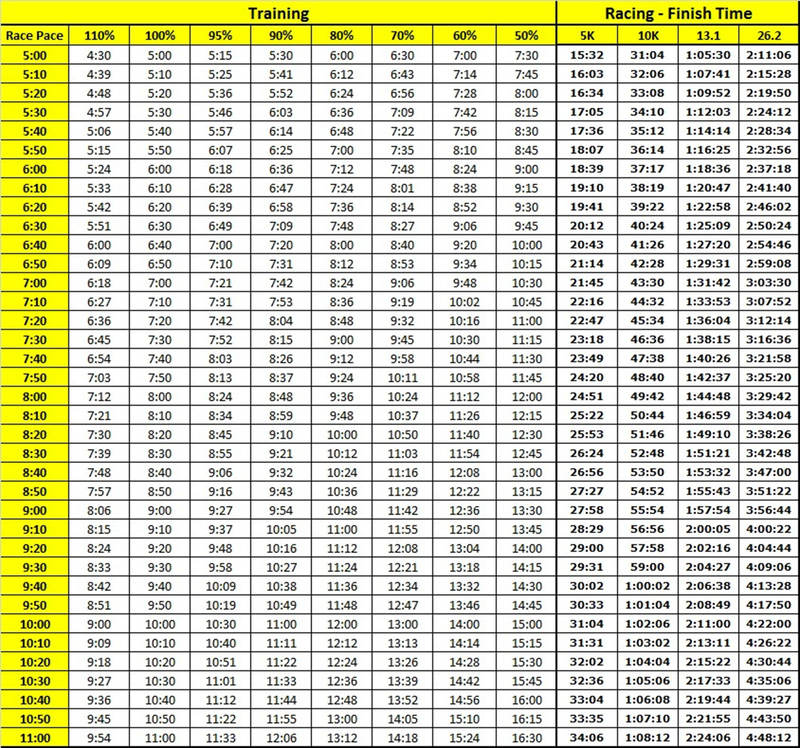 Marathon training takes especially careful planning, as even the best of the best get injured during training. 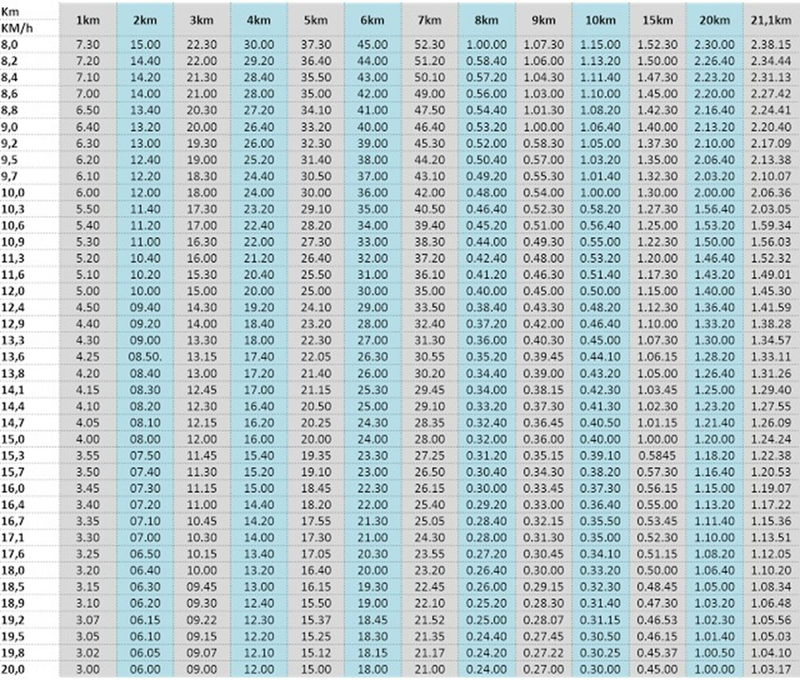 It is important to recognize that long runs should be used to train your body at a pace you will maintain in the race, typically 55-75% of a 3 mile run. In other words, this is a steady pace. Each week, you will increase either your pace or mileage—not both. 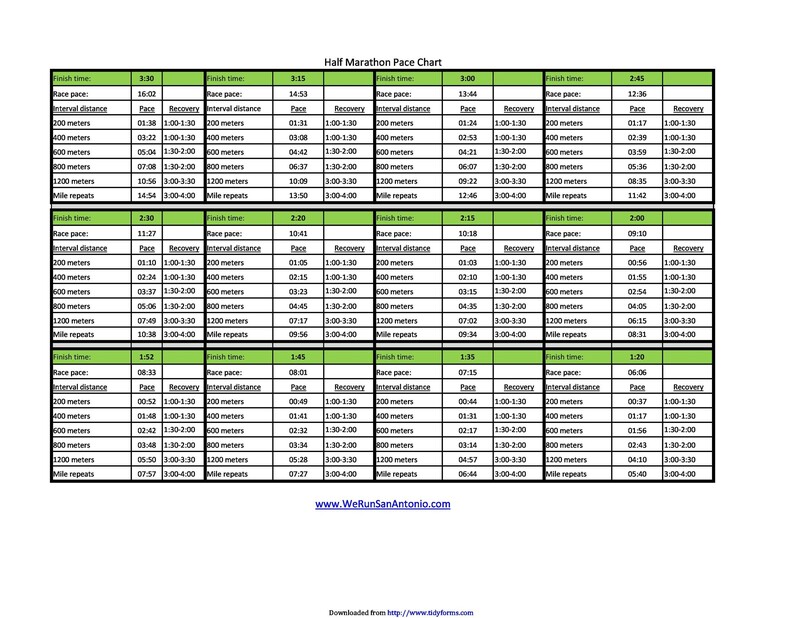 Refer to the marathon pace chart to see how much you should increase based on your current pace. 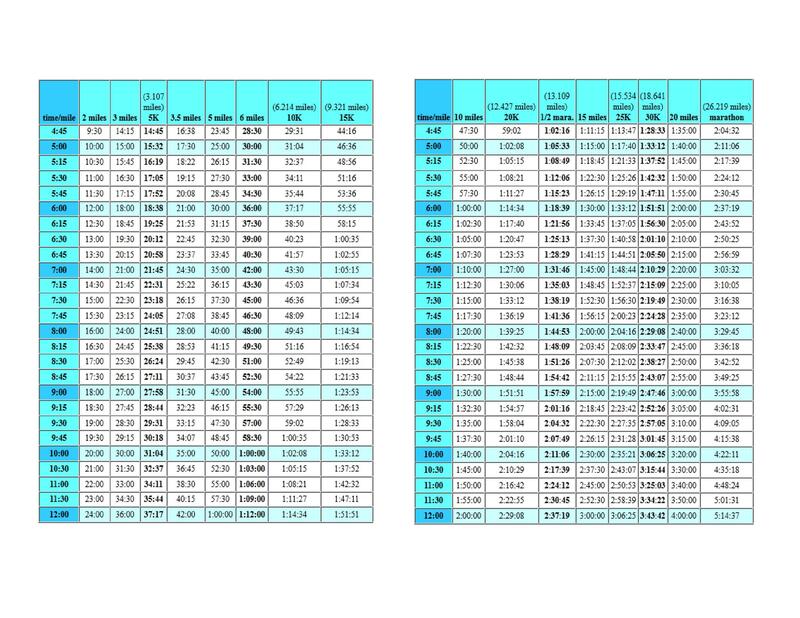 Beyond the training regimen set based on the pacing charts, marathon and half-marathon training takes careful consideration of signals indicating overtraining or under-recovery. This is an important point to consider, because your pace may be too much of an increase. 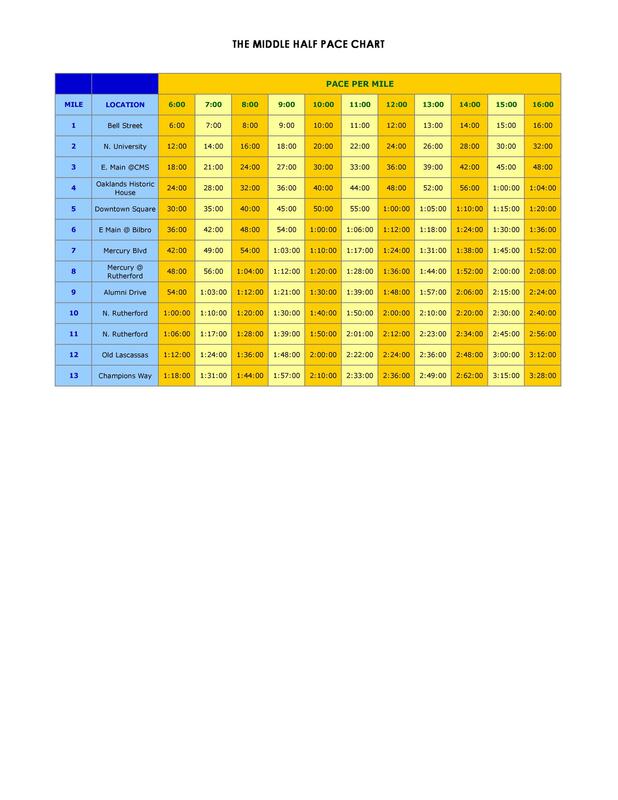 If you begin to notice injury occurring, reduce you pace accordingly using the charts provided. 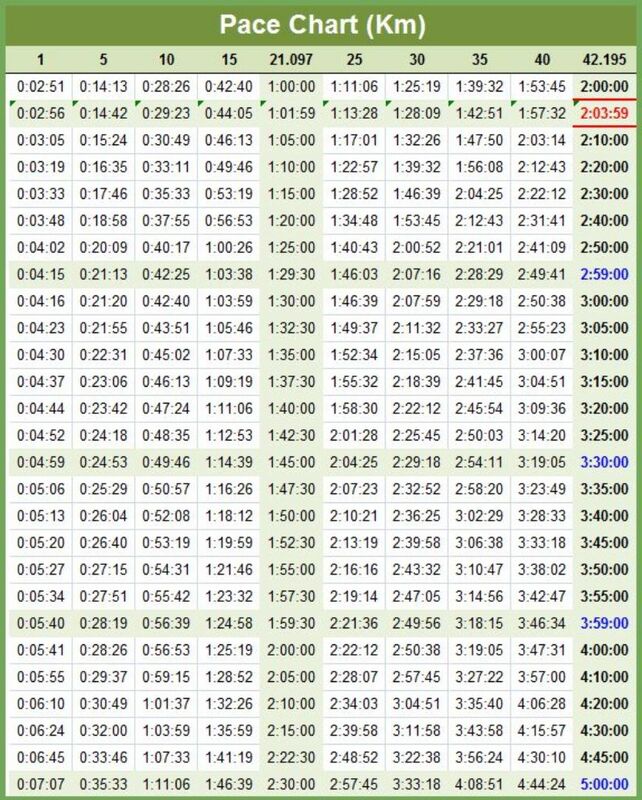 In sum, one should establish the pace that will avoid injury while still challenging yourself enough to see improvements. For those runners seeking specific improvements, a running coach may be helpful. A running coach will likely use progressive regimens to improve distance and help pace you throughout training. Although seemingly small enhancements, these simple strategies often help elite runners to get an edge up or improve personal times. 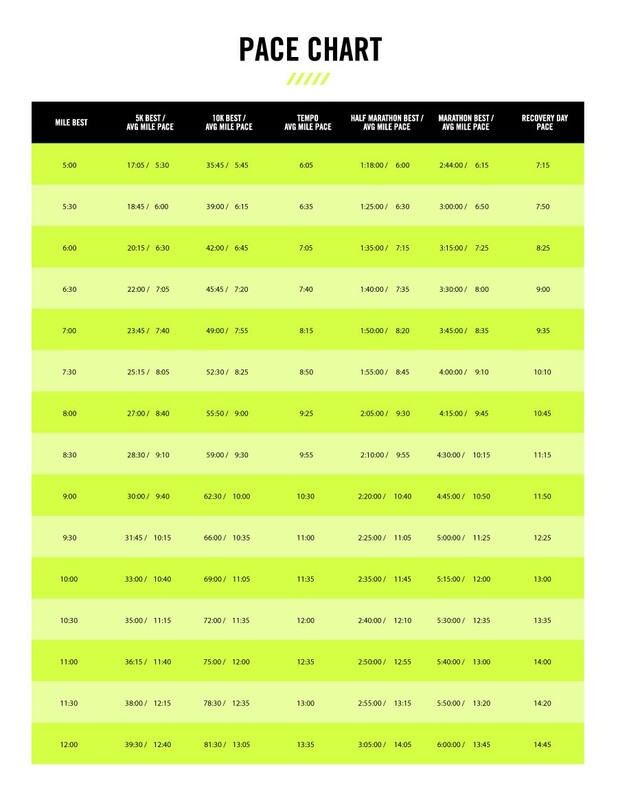 This chart provides a runner with a 10-weel half-marathon training plan that incorporates cross training days, shorter easy-pace runs, tempo pace runs, long runs, and rest days. 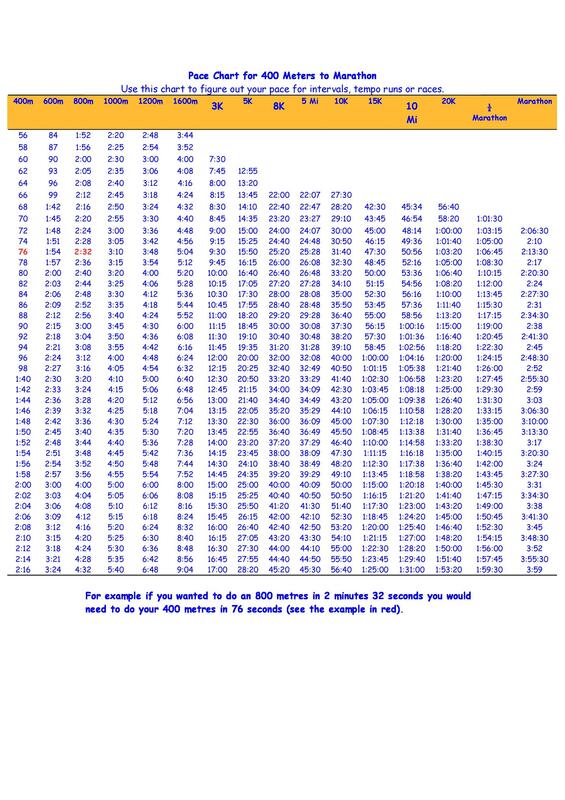 A brief explanation of the workouts is provided as well. 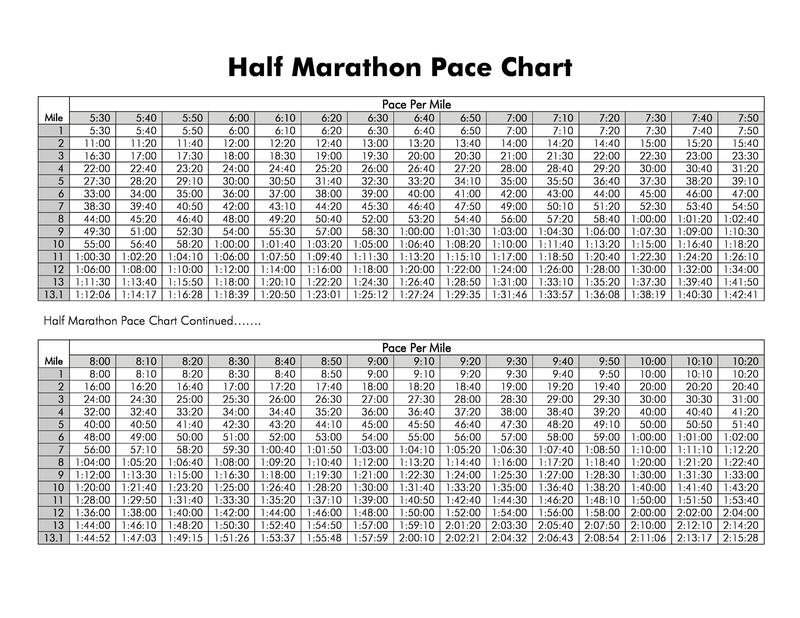 Marathon Pacing Chart: provides a pace adjustment for those looking to improve their average pace per mile. 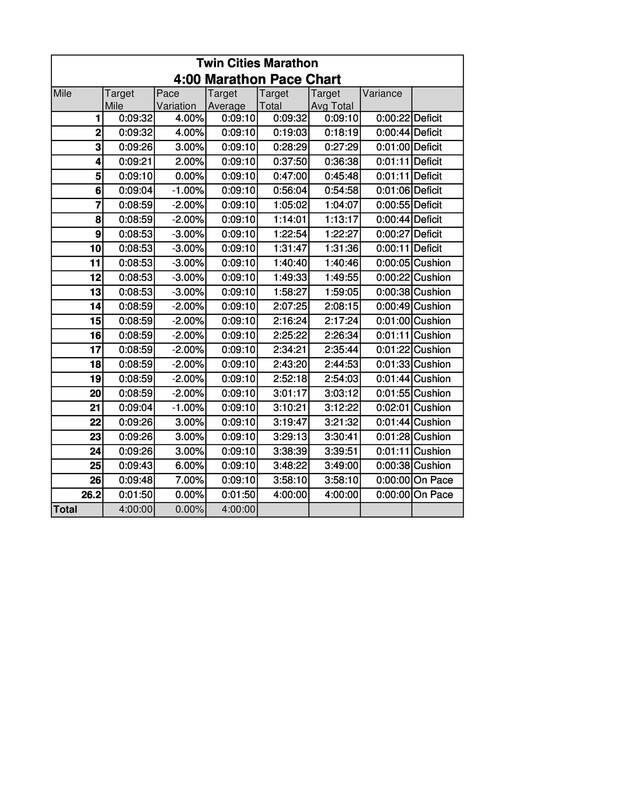 Allows a runner to identify their previous race time, and set a new goal for improved time on the next race. 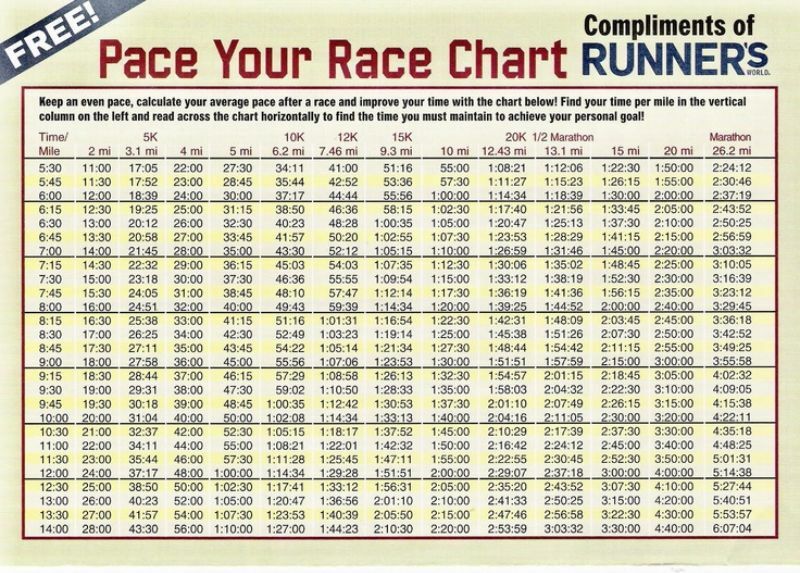 Each chart does a nice job of illustrating the progression of pacing oneself in an effective manner, and also provides a goal-time according to the individuals typical race time. 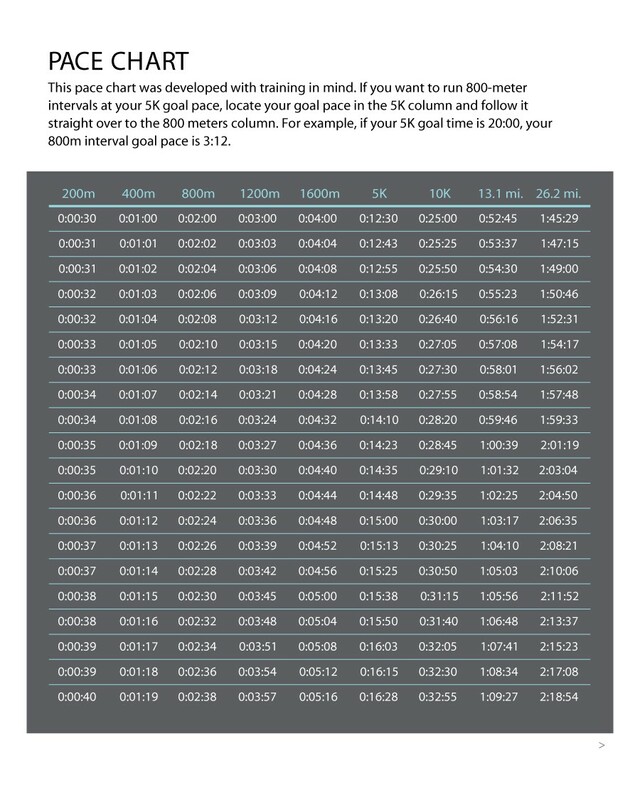 Whether one is setting out to run a their first half-marathon or marathon, run a half-marathon in under an hour and 30 minutes, or setting out to run a marathon at a steady 10 minute pace, a marathon pacing chart will help you establish a more effective training regimen to achieve your goal and become a part of the select group of half- and full-marathon finishers. 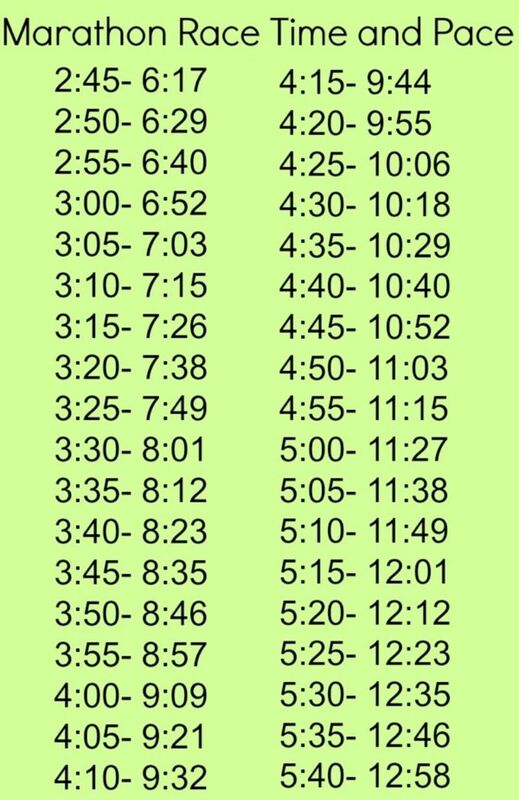 After considering your current pace for a 3 mile run, one can easily find what pace they should train at in order to avoid injury, improve running capacity, and increase the enjoyment one finds in the marathon experience!